Watch Monday, Oct. 24, 2011 on PBS. See more from Nightly Business Report. 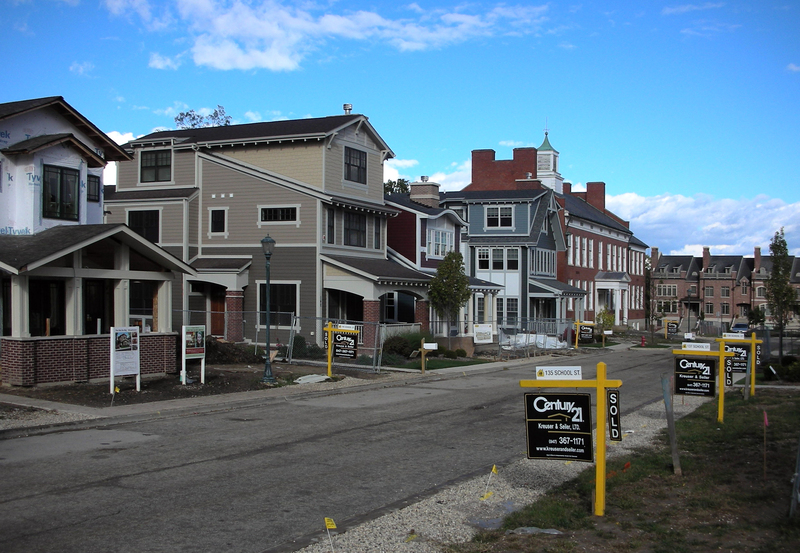 Urban infill model addresses modern-day phenomena of foreclosed “redfield” sites. Stop by the bustling SchoolStreet Homes development in Libertyville, Ill., and feel the earth move under your feet. No, it’s not just the construction underway on eight of SchoolStreet’s 26 homes. It’s the vibrations of a housing revolution rippling through the neighborhood, invigorating an entire community and inspiring a movement towards a new model for housing success. In an economy where “redfield” sites are an increasing issue for cities, SchoolStreet’s urban infill model is sparking a much-needed paradigm shift. The newly coined “redfield” term refers to development property sites that have been foreclosed, short-sold or repossessed by banks. The excitement has been further amplified by the presence of Sarah Susanka, FAIA, architect and best-selling author of “The Not So Big House” book series, who is partnering with SchoolStreet to build her first-ever showhouse for a developer. The combination of SchoolStreet’s architect-driven approach and Susanka’s heralded Not So Big design philosophy is drawing national attention – and homebuyers are coming in droves. SchoolStreet’s successful formula offers homebuyers a more tailored product that can be adjusted and customized to meet individual needs. By utilizing core home plans with a pre-selected palette of materials and finishes, SchoolStreet is bringing high-quality, architecturally designed homes to the marketplace at value-driven prices. 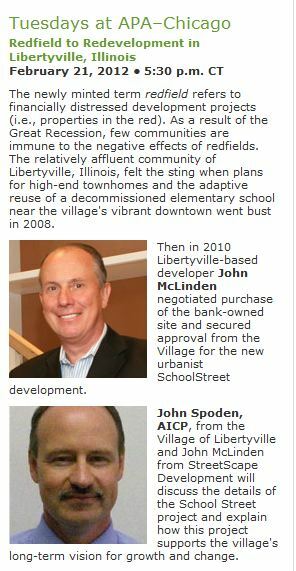 In just less than a year, SchoolStreet has transformed a former redfield into an asset for Libertyville. Bucking national housing trends, McLinden and his team have sold 21 of 26 houses in SchoolStreet. Five of the 15 lofts in the adjacent historic school building also sold within the first eight weeks of being released to the public. Six homes in the neighborhood are currently occupied, with eight under construction and two more scheduled to begin construction in the coming months. A key factor in SchoolStreet’s appeal is the Not So Big Showhouse, designed by celebrated architect Sarah Susanka. Through the years, Susanka has been approached by many developers interested in including one of her house designs in their neighborhood. It wasn’t until she visited Libertyville and saw SchoolStreet that she truly felt a development had captured the elements of her “build better, not bigger” approach to living. The Showhouse features all the hallmarks of Not So Big: quality and character, comfort and beauty, energy efficiency and sustainability. It is currently under construction with tile work, cabinetry, trim and exterior siding in process. The Not So Big Showhouse will open to the public on Saturday, Nov. 19 and remain open for weekend tours for the next six months. A guided video tour of the Showhouse under construction is available on the home page ofhttp://www.SchoolStreetLibertyville.com. The Showhouse will be released for sale on Nov. 19. In addition, three other versions of Susanka’s design for SchoolStreet are available to interested buyers, each featuring a unique exterior street elevation. Floor plans and perspective drawings are available online at http://www.SchoolStreetLibertyville.com. Designed by acclaimed architect Sarah Susanka and located in the vibrant, Front Porch Revival community of SchoolStreet, in Libertyville, Ill., the Not So Big Showhouse is approximately 2,450 square-feet in size, highly energy efficient and filled with carefully crafted spaces and details that reflect all the major elements and key principles of Not So Big. Slated to open to the public on Nov. 19, the Showhouse features outstanding brands and services that exemplify the same Not So Big sensibility including Room & Board®, Marvin Windows and Doors, Priority Energy, Resource Furniture and Creston. With their American Craftsman and Bungalow design character, SchoolStreet’s Front Porch Revival homes blend seamlessly with the historic turn-of-the-century homes in the neighborhood. A key factor in “cracking the code for housing success” is SchoolStreet’s process for customizing each of the homes through an architect-guided design process while keeping in strict adherence to its cost-control model. With a team of leading service and product suppliers providing a wide range of selections for the purchaser, SchoolStreet features 26 homes along with a historic school that will be transformed into 15 urban lofts. The development is located one block from Libertyville’s vibrant downtown, blocks from a commuter rail train station and approximately 30 miles from downtown Chicago. Homes start at $525,000 and lofts start at $175,000. Susanka is the best-selling author of nine books that collectively weave together home and lifestyle, revealing that a Not So Big attitude serves not only architectural aims, but life goals as well. Her books have sold well over 1.2 million copies and have established Susanka as a sought-after resource for her insights into how we inhabit our homes, our planet and even our day-to-day lives. Susanka is a member of the College of Fellows of the American Institute of Architects and a Senior Fellow of the Design Futures Council. “Builder Magazine” recognizes Susanka as one of the 30 most notable innovators in the housing industry over the past 30 years. She was born in Kent, England, and lives in North Carolina. (1) A “brownfield” is an industrial or commercial site that is idle or underused because of real or perceived environmental pollution. Source: Dictionary.com. (2) A “greenfield” is an undeveloped or agricultural tract of land that is a potential site for industrial or urban development. Source: Dictionary.com.